I started working on the Jeep this morning, first disassembling the dash to get the radio out. It wasn’t too hard, but involved removing the center console as well as the glove box in order to remove the anti-theft bolt holding the radio in. Once I got it out, I started pulling it apart in order to get the CD out. It was as bad as I feared it would be, because there were multiple deep gouges through the CD, so now I’ve got to buy another copy. I took a short break to head over to Crutchfield to order a new radio and speakers. I’ve got a pair of 4x6s and 5.25s coming to replace both the in-dash and sound bar speakers, as well as a new Sony head that has Bluetooth and HD radio functionality. It’s a heck of an upgrade from the 2003-era stock radio that the Jeep came with. 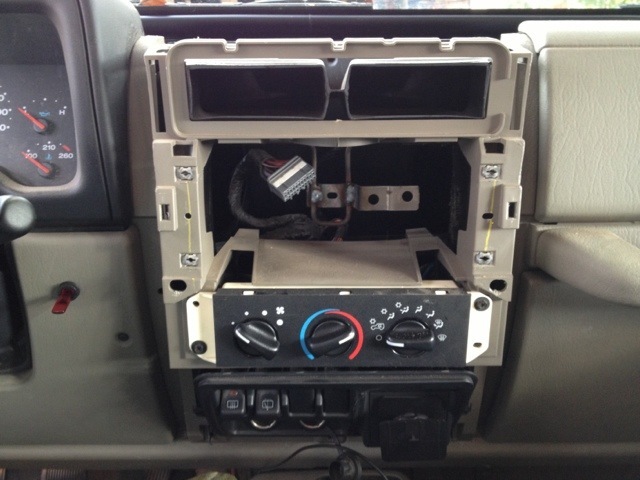 Since the radio was toast, and I needed to remove the old speakers anyways, I did just that. They came out pretty easily, and now I’ve got lots of open compartments in the dash. While I was at it, I pulled the cover below the steering wheel and started in on the repairs to the fog light switch. Due to including air lockers on the Rubicon model, Daimler-Chrysler moved the fog light switch from the center console to the end of the turn signal stalk. Unfortunately, it’s a weak point and mine stays on all the time, running the battery dry. I’d pulled the relay a while back to keep the battery intact, but I miss the extra forward lighting, so it was time to fix. I went a slightly different route than some of the other guides on the Internet, just because I felt like it. What I did was open up the wiring bundle on the right of the steering column, located the white wire with orange tracer, and cut it. From there, I spliced in a lit rocker switch so that the original fog light switch would still work, but until that rocker is switched on, they won’t come on. They work just fine, and the indicator light in the instrument cluster still works, so I’m calling it good. I buttoned up some of the loose bits, but left the center console and speaker compartments open so that when the stuff comes in, I’ll be able to start installing a little quicker. Hopefully that’ll be in before this coming weekend. Here’s a before pic. The new fog lamp switch is already installed in this one. What? no pics of the open heart surgery? Every time I’ve pulled a dash apart I’ve gazed in horror at what I have to put back together. Yep, it was a mess under there. Let me see if I can upload a pic from the phone. The new radio is great, so it was definitely worth it. Now I’m chasing a vacuum leak in the evap system. That one may require me to actually take it in to a shop.